Mr. Hu (from Ningguo) and I (from Beijing) arrived at Yushe county (Shanxi) around 10pm on July 10. In the morning of July 25(Friday), we talked with 45 of the 46 students we supported. All is thanks to Mr. Liu's (vice principle) effort as he has to call each student to make sure they come (the semester has ended). Among 14 students who took college entrance exam, 11 were above first class university score line---very very impressive. I started this program in 2008 at request of Mr. Yonghong Ren, who came from this county and with his and his friend Mr. Wang. Mr. Wang has done great work but was out of country (visiting his daughter) during our visit. Last year, I transfered the work to Ningguo City Zhong Mei Ai Xin (our partner in China). At request of Mr. Hu, we went there for the first time to see and talk with these kids (I only went to my hometown in previous years). At the group meeting, after a brief introduction, I told them briefly about donors (you), all ordinary people, gave a little advice on college life, importance of hard work and self-confidence, and caring. Mr. Hu gave a more detailed talk about this charity, how the program works, and etc. We both encourage them to give up the support when they don't need it anymore and also encourage them to seek help when needed. After geneeral meeting, we talked with all 12th graders and some other students individuals. Two of the students will not seek out support in college, one will give up in one year after her older brother graduates from college. One more told me that she might give up after one year in college if she can do some part time job in college. Very good kids. They are all encouraged to our qq group and become part of the community. After lunch, we went go the countryside under Mr. Liu's guidance to visit students' family, 8 of them as they are all in the same line. It could be 9 if the ninth has any family member as home. We were a little shocked at how poor these families are and learned some custom and geography about this county. The following are some of familes we visited. On Saturday morning, we visited only 4 familied as they are in a more diverse areas. We left the county in the afternoon with appreciation of their difficulty, and their appreciation of the support. It is very moving to talk with them and their family. Generally speaking, the county is poorer than my east and south part of the country. We did not see any 2 floor houses in the countryside. There are very few industries in the county, very few private business. There is no coal in this county. Since there are two highways passing through the county, I hope that there will be private business coming to the county, and young people here will go to better developed places to learn and bring good ideas back here. Oh, this is the first time I intentionally missed the names of the students at suggestion of some friends and donor (to protect the students' privacy). How do you think? Please let me know if you have strong opinion either way. This loverly girl was adapted by her deaf father, lives with her father and grandma of 79 in countryside of Yuseh County, a provincial poor county in Shanxi (without coal). Both her father and her grandma are very caring but could not provide her enough financial support for obvious reason.Her house collapsed last Fall and was rebuilt with support of government and volunteering neighbors---still nothing inside. Despite all these, she did really well in college extrance exam, got 68 points above first class university score line---amazing! She was supported by Dr. Cai in hgih school, and will be supported by Julia in college. Up Left: Her open kitchen (stove in the far left corner). Bottom Left: her grandma, deaf father, neighbor, her, vice principle, Dr. Yang. Bottom Right: Outside Door. This lovely girl (below)is in 10th grade, lives with her parents, older sister, and a little brother (4th grade in 13-14). Her father has a lot of health problems and can not go out to do odd jobs. Her mom has been a babysiter for 6 years at a Tai Yuan (the capital and big city in Shanxi), starting when her son was only 5 (mom was still very sad when talking about this) to support the family. Her older sister graduated from high school this year and will go to a three year collge instead of trying again next year in most of Yushe students do---because her family can not afford it. Personally, I think a three year college at a more prosperous region is not a bad idea at all and told her family so. The room is all her family have. This girl is in 10th grade in 2013-14. She has a big family, parents, two younger sisters (one in photo), and one little brother in 2nd grade. As you can see, all kids are outstanding in school. She sets a good example for her siblings and is 37th in her grade (about 800 students). Her mother did a surgery a couple of years ago costing $4-5k, and her little brother had some blood problem costing over $10k (70k Yuan RMB). Her father does odd jobs to support the family. She has been supported by Lianlian. This girl is in 11th grade in 2013-14. 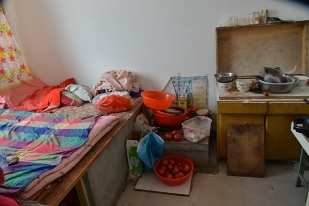 During semesters, she, her younger brother (also in school), and her father rent a room in Yushe city near her school. She cooked food for her brother and dinner as her father needs to do work. During summers, she and her brother live with her grandma in the countryside. The photo is her home in countryside but she does not have a key so we did not go in. Her mom also does odd jobs likely in another city but she was relutant to talk and we did not ask further. She has been supported by Mr. Jiang. This photo is at a 12th grader's home with her mom and the vice principle who are with us. I talked with the girl herself at school but forgot to take a photo. She tried to come back to meet with us at home but did not get home in time (bus problem). Her father does odd jobs to support the family of 4 (and plus half for her grandma), and has back and neck problems. Her sister is in 2nd grade. She got 70 points above the first class university line and hoped to go to Shangxi Normal University for free tuition. She hopes to become a math teacher. in the middle is Mr. Hu Jining, president of the Zhong Mei Ai Xi and our main volunteer in China. He has to take overnight train (15 hours) to get back to Ningguo from Yushe. There are two other similar situations to the above boy. In all three cases, we (Mr. Hu and I) did not understand why they need support, as they have at least father and brother working outside and not a big family. But their homes are clearly have nothing. The only explanation was given by the vice principle Mr. Liu who accompanied us: their brothers went to work only after 9 year education (likely did not do well in school) and can not work at lowest level---lowest pay. Of course, you don't expect a young person (less than 20) to know how to save money and think about the whole family. It seems obvious to us but not to poor area people that kids needs at least a high school education. I don't know how widespead it is. It is very rare now not to finish high school in my home county---Ningguo---where our main operation starts. The following photos belong to two different students.